B2B email marketing has become a cornerstone of B2B lead generation. It’s the glue that ties campaigns together and often the first vehicle for communicating with new prospects and existing customers. It’s can be the first thing a new target sees from your company and almost always the preferred method of communication. With the increasing use of marketing automation solutions and email service providers, the volume of email has exponentially increased. Likewise, so have the tools to filter out unwanted messages (spam triggers). The use of these marketing automation tools has also forced copywriters to focus on building better more relevant messages that can be delivered to a much broader audience. Just because you can send in HTML – Think twice… -Don’t start changing font styles because you can. If you’re not using 20 point font in your normal daily email, why unnecessarily add it to your email marketing programs. Bold and slight increases in font size are often enough to highlight important elements of your message. Use a minimum font size of 12 pt for body copy and keep headlines at a minimum. Design your email for readability. If you’re shrinking your font size down to squeeze in more copy, you should consider editing out what doesn’t need to be said. Stick with common fonts like Arial, Tahoma or Times New Roman. Better yet, don’t specify a font type at all. Most users have a set font that works for them. The more you change fonts, the more code is required in your email and the higher your spam rating. Avoid Images as they are often blocked anyway – Keep them to a minimum. Just remember what your email will look like with all those SQUARE warnings and such. -Doesn’t really invite confidence to request them to be unblocked especially if that is your first interaction with a target. If you need more images your probably adding too much and you’re light on content for the email. Avoid the use of color. Particularly the color red for text. Color is another good indicator that your email is being generated in bulk. Use basic HTML coding or consider using none at all. Style sheets are a dead indicator of marketing fluff so keep your designs simple and use tables to control layouts. Another benefit of old-school HTML standards is that they are virtually universal across browsers and e-mail applications. Pay attention to your subject line. It’s heavily weighted in spam scoring. It’s also the first thing your target will read. Much like your body copy, avoid the blatant use of spam trigger words such as free, save now and anything related to adult content. Make sure you comply with spam laws and protect your credibility. Spam complaints are tracked by your ISP and influence your deliverability score long before they get to your prospects email filter. 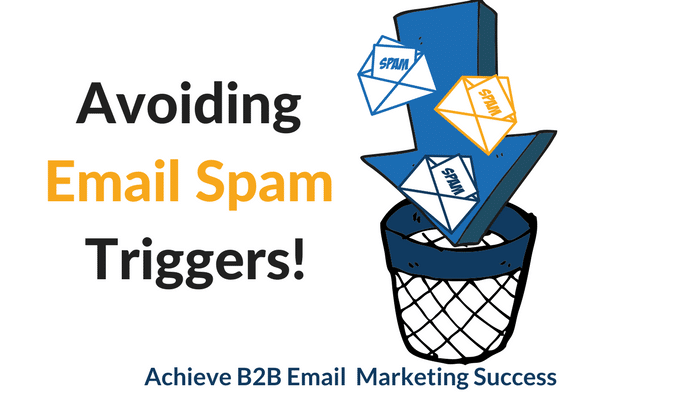 Clearly, to be successful with B2B lead generation you need to leverage email marketing and all of the efficiencies it provides. But to use it effectively, you must be able to craft a message that not only appeals to your audience but also avoids triggering your recipient’s spam filter. That requires understanding the principles of how spam filters work and applying this knowledge to every email you send. If you enjoyed this article you may appreciate or post on Improving E-mail deliverability. B2B email is a valuable communication method to engage with your prospective market, but only when approached strategically and methodically. If you’d like to schedule a brief chat with the ResponsePoint team, we can discuss your email efforts and approach and help you discover better ways to improve your marketing processes, email deliverability, and campaigns success.